I learned a lot about Tiger tanks while building this kit. Prior to construction, I had absolutely no reference material on the Tiger, and I now have quite a bit. First of all, the name: What is an Ausf.H? According to T. Jentz in Osprey's New Vanguard book on the Tiger I, when the Tigers first entered production, the name was Ausf.H. 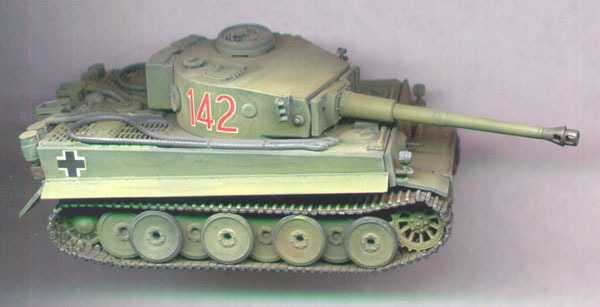 In March, 1943, the name was changed to Ausf.E. There were no specific changes in the vehicle that corresponded to the name change, as many changes were introduced throughout the production of the Tiger. Before March, 1943, Tigers were officially called Ausf.H, and after March, they were all called Ausf.E. This kit represents one of the earliest production models of the vehicle, hence the name. What I consider to be the main drawback to this kit, is that it allows you to build only the earliest version of the Tiger, that being the version in use by the 501st Heavy Panzer Battalion in Tunisia during 1942 and early 1943 (with some very minor alterations, you can also build the first Tiger that went into combat, from the 502nd Heavy Panzer Battalion at Leningrad). The kit comes with many optional parts, and the instructions even show where all these optional parts were to go, but the limiting factors are the square muffler shields, and the SMG port on the right rear turret wall. The square-style muffler shields were used only by the 501st and nobody else. Also, the right-side SMG port was replaced by an escape hatch at the end of December 1942, so some of the other optional parts included in the kit cannot be used, because they were introduced after the escape hatch (which is not an option included in this kit). Specifically, the loader's periscope on the turret roof (part no.40), and the spare track links on the turret side. None of these parts should be added, because they were not seen on Tigers used by the 501st. Unfortunately, I didn't realise this until after I built my kit, and I inadvertently added the spare track links. Some day, I will go back and remove them. With the understanding that this kit can produce only an accurate vehicle from the 501st Heavy Panzer Battalion (or earlier), it is time for me to say that it is an outstanding kit, and builds into a remarkable replica of a 501st Tiger. There is no decent alternative on the market today for an accurate Tiger I. See my Tiger Comparison article for further comments on this kit, compared to the Hasegawa Tiger. The engine deck grills are molded all the way through the hull. All of the appropriate details specific to the 501st Heavy Panzer Battalion are included, such as the narrow front mudguards, the square-style muffler shields, the option to attach the headlights to the front of the hull, and the overly-large balkenkreuzes. The overall level of detail is outstanding. All of the hinges, bolts, tools and hatches are molded in excellent relief that just begs for a good wash and drybrushing. The turret shape has the correct enlargement of the left side of the turret (the gun is mounted in the dead center of the turret, down the centerline of the tank). The link-and-length style tracks are, by far, the nicest injection molded tracks I have seen on a 1/72 scale tank. The commander's hatch is detailed on the inside too, in case you want to add a commander figure in the open hatch (figure not included in the kit). The floor of the hull side sponsons that are above the wheels and tracks have the correct concave shape to them. Not flat as in the Hasegawa kits. The hull MG is the most delicate and "scale-accurate" representation of an MG-34 that I have ever seen. Ease of construction. Overall, the assembly was incredibly simple, with almost no hassles (a couple noted below). Only the commander's hatch is molded open. The loader's, driver's and radio operator's hatches are all molded shut. The pioneer tools are molded onto the hull. I prefer the option of attaching these tools only if I want to. Not all Tigers had a shovel attached to the hull underneath the cannon barrel, for example. The heat shields around the mufflers were a very tight fit, and had to be slightly bent to get them to fit between the mufflers and the feifel air filters (in fairness to Revell, photos show that this was also the case in real life, but maybe not to the extent required by the kit). The smoke grenade launchers on the turret could have been shaped a little better. The holes for the spare track links on the turret side need to be filled (they are very large holes). It was not easy fitting the track links on the tops of the wheels, because of the overhanging hull sponsons. Revell did better with their Panthers, where they gave the builder the option of building the entire wheel and track assemblies separate before attaching them to the hull. The apertures for the driver's periscope are missing from above the visor on the hull front. This is an easy fix with a fine drill bit. The balkenkreuzes are printed out of register on my decal sheet, which seems to be a chronic problem for small scale armor manufacturers. The kit includes the option to leave off the outer-most wheel of the first pair of bogies, and replacing it with a simple hubcap. The only photos I have ever seen of this were some pictures of Tigers in a training exercise. That could make a neat diorama. I think that the tow cables are far too stiff and heavy to use. I used mine, not realising this, but if I were to build another one, I'd replace them with some real wire or thread, so as to make them better conform to the surface of the hull. I replaced the hatch handles for the two turret hatches with bent wire. I also added a handle to the exhaust fan cover on the turret roof (part no.41), because I've seen some photos that show a handle on this piece on some vehicles. It is very important to continuously dry-fit the track links as you are attaching them. If you use superglue like I do, any miscalculation will result in either a gap, or bunched-up track (see photo above). The mudguards on the hull sides are blanked off at the front and rear. Some Tigers had plain sheetmetal guards, with no blanking at the ends. I clipped off the corners, and thinned the edges with sandpaper to better simulate the sheet metal. Painting: There is still some controversy over the colors used on Tunisian Tigers. Were they gray? Tan? Green? I chose to follow the thoughts of Tom Jentz, and I painted mine with a base color of Panzer Grey. I then added a lightened "pea green" overcoat, to represent a field application which didn't completely cover the gray. And finally, I added considerable amounts of dust, which gives it a very tan appearance. In conclusion, this is an absolutely superb kit. I had a few minor issues with it, but what kit is perfect? All in all, an excellent job again, Revell! Postscript: I recently browsed through Jean Restayn's book Tigers on the Western Front, and according to this book, the turret numbers for this vehicle should be only white outlines, and no red fill. Oh well.